Colour correcting makeup: It's easy. Explainer: What is "colour correction" and do I need it? Welcome to the world of colour correction, where concealer and primer comes in shades of green, purple and yellow. But don’t be scared off by these gelato colours – colour correcting products are actually genius. In just one swipe, they can correct complexion issues such as redness, sallowness and dark blemishes. We spoke to Jamie Kern Lima, the co-founder and CEO of IT Cosmetics (available exclusively at Sephora), to learn more about colour correction. What should we use colour correcting makeup products for? “Using colour correcting products helps customise your coverage and address each coverage concern in a targeted way,” explains Jamie. So, if you have redness, hyperpigmentation, dark spots or blueness under the eyes, a colour correcting product can be your best friend. The coloured makeup product will counteract the blemishes of your skin, to create the illusion of a flawless complexion. Why are colour correcting products such strange colours? Although colour correcting products come in shades that you would usually avoid, when they are actually applied, the colours are so subtle and sheer that they are undetectable. To understand the reason behind the crazy colours, Jamie suggests that we think back to the colour wheel. “The opposite colour on the wheel cancels out the colour that you see,” explains Jamie. Here’s her guide on what to do with each product. Green cancels out Red: "If you have acne or redness of any type to your skin, green will neutralise the appearance of the redness." Purple cancels out Yellow: "If you have a sallowness to your skin, purple will perk your skin right up." Yellow cancels out Blue/Purple: "If you have the bruised blue of dark under eye circles, yellow will erase it from view. Yellow will also correct the darkness of hyperpigmentation." Will I look like an alien or clown if I use these coloured products on my skin? Luckily for me, Jamie answered this question with a straight face. What, do you want to look like an alien at work? Her tip is to ensure that you apply the product with the right beauty tool. “Using the right brushes will make all the difference,” she suggests. Jamie recommends IT Cosmetics’ Heavenly Luxe Complexion Perfection Brush #7, $48, which has a smaller brush on one end for targeted coverage, and a fuller end to blend out the facial makeup for an airbrushed effect. Here&apos;s a tutorial on how to use green primer to counteract redness. Remember, after applying the primer, pop your usual concealer or foundation on top. Got dark circles under your eyes, and want them gone now? I did! This tutorial will show you how to use purple concealer to banish dark undereye circles. 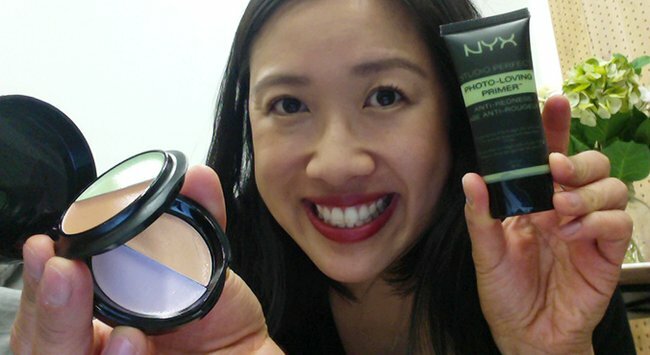 Keep an eye out in Target for the NYX Studio Perfect Photo Loving Primers in green and purple, $19.95, as they are affordable and have a great consistency. Not only do they prime the skin for optimal makeup application, they also correct complexion issues such as redness and dullness. Another entry point into the world of colour correction is the Australis Conceal Correct 4-In-1 Palette, $13.95. It’s a cute little compact with green, purple and beige concealers, and you can use it for more targeted colour correction. I&apos;m now going to incorporate the purple concealer into my everyday makeup routine for under the eyes, because it really does help to banish dark circles. A personal favourite of mine is the Maybelline Cover Stick Corrector Concealer in Green, $8.69. It’s a quick, cheap buy if you need emergency coverage of the giant red pimple that’s popped up on your chin the day before your wedding. Yep, it happened to me. Jamie suggests layering complexion and colour correction products, “to even the overall appearance of your skin”. She recommends the IT Cosmetics CC+ Cream, which works to colour correct the skin while also providing six other skin benefits. This product comes highly recommended by our site coordinator, Lizzie Marton, so you know it’s good. Have you tried colour-correcting makeup products? What products and techniques can you recommend?